Tanya was born in London and studied in Surrey, where she still lives with her cat, who goes by several names, none of which he actually answers to, and her puppy, Frida. 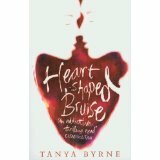 Her debut, Heart-Shaped Bruise, was shortlisted for the CWA John Creasey (New Blood) Dagger and longlisted for the Branford Boase Award. Tanya was also shortlisted for New Writer of the Year at the National Book Awards. She has a weakness for boys with guitars, drinks far too much tea and even though her mother tells her not to, she always talks to strangers. Find her on Twitter @tanyabyrne and on Tumblr. For Holly: Lola Durand hates her stepmother. It’s a cliché but it’s true. Lola Durand can’t get through to her father. He never wants to talk about the things that matter: why they had to move to Paris, why he had to marry evil Agatha, and how they can get through the heartache of her mother’s death together. If he won’t listen, she’ll show him. She’ll show him the truth about his new wife and then her life can go back to normal, just the way she likes it. Lola Durand knows a secret about her stepmother. She’s going to share it. Hear t-Shaped Bruise: ‘They say I’m evil. The police. The newspapers. The girls from school who sigh on the six o’clock news and say they always knew there was something not quite right about me. And everyone believes it. Including you.But you don’t know. You don’t know who I used to be. Who I could have been. Sometimes I wonder if I’ll ever shake off my mistakes or if I’ll just carry them around with me forever like a bunch of red balloons.’ Awaiting trial at Archway Young Offenders Institution, Emily Koll is going to tell her side of the story for the first time. Follow Me Down: When sixteen-year-old Adamma Okomma, a Nigerian diplomat’s daughter, arrives at exclusive Crofton College in Wiltshire, she is immediately drawn to beautiful, tempestuous, unpredictable Scarlett Chiltern. Adamma and Scarlett become inseparable – until they fall for the same guy. Soon the battle lines are drawn and Adamma is shunned by Scarlett and her privileged peers. But then Scarlett goes missing and everything takes a darker turn. Adamma always knew that Scarlett had her secrets, but some secrets are too big to keep and this one will change all of their lives for ever.